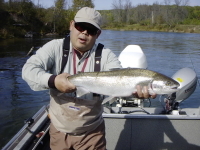 The Fall run of steelhead was soft for 2014, so Spring fishing in 2015 should be great! Look for early fishing in March to be good to great with less fishing pressure. 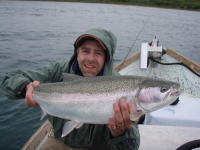 Peak Spring Steelhead fishing will be the first couple weeks of April. Belize fishing package for $1795 all inclusive (meals, rooming, and transportation to and from ferry or airport in San Pedro, Belize.) 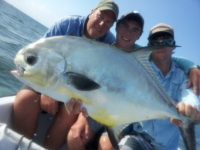 Belize non-fishing package for $995. Belize offers some of the worlds best opportunities to dive and snorkel in gin clear water, and is filled with great opportunities to explore, enjoy great weather or just relax and get away. 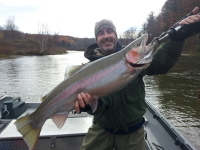 Spring Steelhead Fishing- March is looking to be great steelhead fishing in 2015. Fall fishing has been slow compared to the last several years, so our spring run will be much stronger. 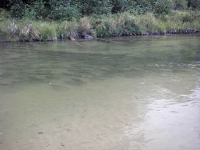 Look for March to fish well for fresh steelhead staging for the spawn in late March and early April. 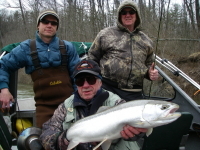 The peak of the run should be early April, and will provide some great steelhead and trout fishing with fresh steelhead heading into the river systems to spawn. 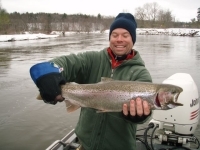 Trout Fishing- Trout fishing will take off as the local waters start to warm with spring weather. 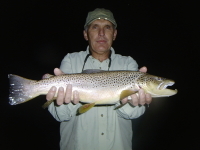 Trophy trout fishing with streamers takes off in late April and continues through May. Late May and June are great hatch months, and June tops things off with the famous Hex Hatch. This is also a great time to learn the sport, and we offer schools and instruction no matter what level angler you are. 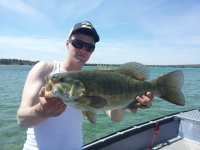 Grand Traverse Bay (Trophy Smallmouth Bass Fishing)- Smallmouth bass fishing starts to heat up the later portion of May, and continues into early July on the fly and continues throughout the summer on light tackle. 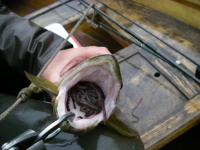 The Bay is rated top 10 in the country, and can produce some of the best smallmouth fishing in the country at this time. Dates are limited at this time do to demand, so if you are interested.... get a hold of me, it's that good!! 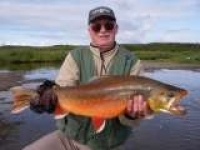 Naknek River (SW Alaska Fishing)- Alaska fishing package $2495 all inclusive. The fishing is as good as it gets! Millions of Sockeye salmon enter the Naknek River along with big King salmon to start the season. 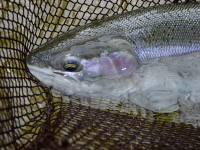 Trophy Rainbow trout that have stayed in the river after spawning crash salmon smolts returning to Bristol Bay , and fish into the 30" range are common. Char, Grayling, Dolly Varden, Northern Pike, Chum Salmon, Pink Salmon, and Silver Salmon make for a great summer! Fall on the Naknek River is hands down some of the best fishing in the world for trophy rainbows!! Located in Katmi National Park and only an hour from the famous Brooks falls and yes bears!! Looks like another great season in 2015. Contact me if you or someone you know is interested in one of these great fishing opportunities. I also offer gift certificates, schools, and instruction. 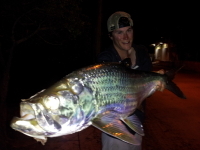 Vist our website for fishing reports, photos, and more information on the great fishing opportunities in 2015. If you still are having problems finding that special gift for the hard to shop for person, I do have Gift Certificates (guided fishing trips, casting instruction, tying classes, fly fishing instruction and schools, custom flies for the rivers and seasons in Michigan, Alaska, and Belize. I can mail or e-mail a gift certificate in a short period of time to be placed under the tree. 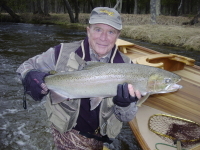 I book guides all over the state, as well as my guide service in Northwest Michigan (Manistee, Muskegon, Pere Marquette, AuSable, Betsie, Platte, and Boardman rivers.) 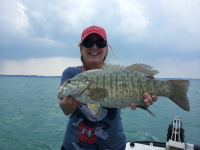 Don’t forget the great smallmouth fishing in Grand Traverse Bay and shoreline fishing on Lake Michigan.